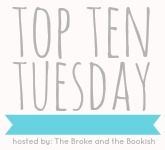 This week's Top 10 Tuesday prompt wants to know which books are our favorite beach reads? Well, since beach reads can be defined in so many different ways, I decided to put together a list of book that I've read - which I think would be great books to devour while soaking up the sun on the sand! Ah I love your list - and many of these would be on my list too!!!! Especially Meant To Be and also From What I Remember!!!! Great list! I want to read Meant To Be. I love Sarah Mlynowski and Sarah Dessen. I still need to read Meant to Be. I've heard great things. Great list! The cover for Lovestruck Summer seems like it was made to be a beach read! UGHHH.. I haven't read any of these. I am ashamed. I have read Sarah Dessen's books though and love them! I haven't read any of these books...what is wrong with me? I love Sarah Dessen so I plan on reading Along for the Ride (and her new one) on vacation this year. Thanks for sharing! Meant To Be is so fun! And I love Jennifer Echols--can't remember if I've read Endless Summer, though. Great list! The Probability of Miracles is on my list, too. It's such a great book that I feel got overshadowed by TFIOS (especially since they came out around the same time). Ten Things is a really good book, too. I love Jennifer Echols, but I haven't read Endless Summer, I need to do that. And Meant to Be, I see that on so many TTT lists and I still haven't read it. And I have it! No excuses, I just need to do it.